Day Four - Wonnangatta Valley is top left. Eaglevale is at the end of the track from there. Dargo is just above right bottom section of track. This morning we were up earlier at 7:15 am to try and beat the flies (we didn't) and gone by 8:30 am. 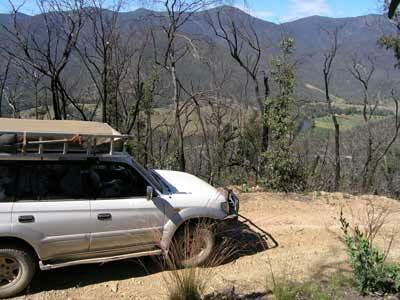 We continue along Wonnangatta Track and after 10 kilometres we come to Herne Spur Track. We could have taken this a bit further along the valley but we continued on what is now Wombat Spur Track this goes up a small creek and then climbs steeply to the ridge. 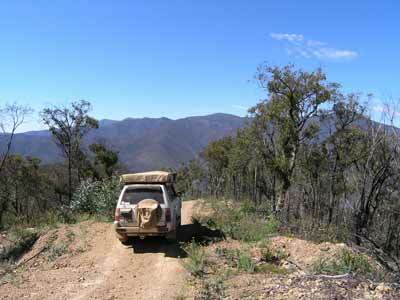 It then follows a series of ridges, getting to about 1200 metres at one stage. 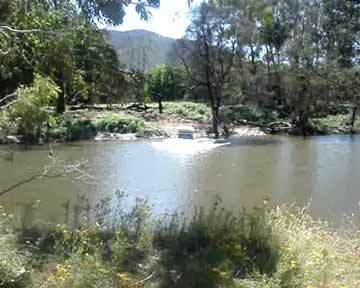 Yesterday and today we encounter a few vehicles who tell us that the water in the Wonnangatta River at Eaglevale is very deep. However, they all assure us that we will get across with the use of an engine tarp. We hear a lot of chatter on the UHF radio and figure out that there is a large group ahead of us. The track we are on becomes Cynthia Range Track (at least in some maps and books) and at the intersection with Eaglevale Track, we find about 15 cars stopped for morning tea. They are on a tag-along trip. 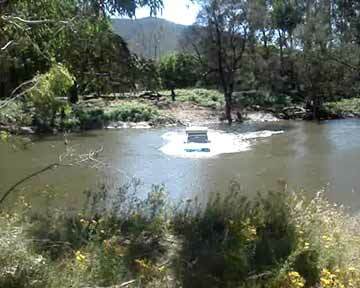 We figure that considering all the cars look brand new, they will not be coming down to try and cross the river at Eaglevale. We start the steep descent to the river and at 10:30 am we arrive at the crossing. It is at about 40 metres across and running fairly quickly. There is a bloke across and I shout to him to see if he is going to cross. Turns out that he is just watching! A few more cars turn up and I speak to one on the radio who says he crossed yesterday. He tells me to use first gear low range and aim above the exit. We tarp up and I send Kelly to walk across the pedestrian bridge so that she can take some photographs. She comes back advising that the bridge is missing many planks. Well, here goes nothing with about 20 people watching. I take off and the water comes about a foot over the front of the bonnet. It is higher on the right side and about half way across I start to worry a bit. We are losing grip and every now and again we jump a bit to the left (downstream). I change my direction so that I am aimed more to the right of the exit and finally I am across. What seems like forever actually only took about 10 seconds. We pull up and there is water streaming from everywhere. However, none has got in the car so we are okay. A girl videoed us on her camera and we watch it a few times. She promised to email it to me and in late February 2008 I received it. 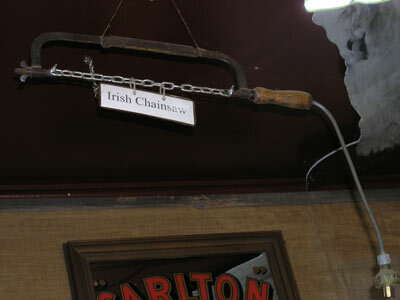 Two of the frames from the video are attached below. If you want to see the video, click here (the file is Windows Video file 1.43Mb). After I cross, all the cars leave and we are alone. We decide to have morning tea here under the shade of a huge tree. When we have finished, we head off at 11:00 am. The road from here is a bit better. 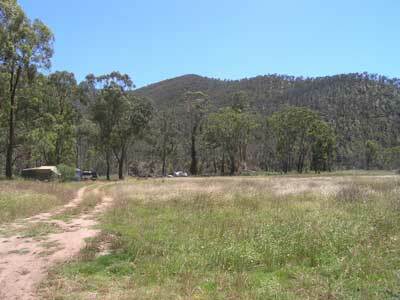 We pass Eaglevale Camping Area (not too bad) and later on Bullocks Flat Camping Area and Snakes Creek Camping Area. These all have quite a few campers. It is about 51 kilometres to Dargo and it takes us 85 minutes to get there, arriving at 12:25 pm. This small town is very quaint and the street is full of four wheel drives. We find a tree to park under as it is again very hot, well over 30ºC again. 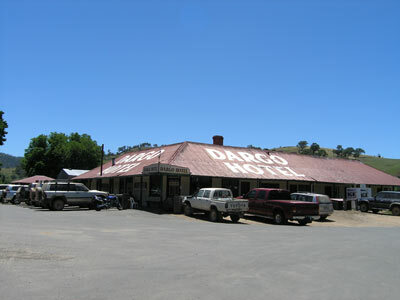 We head to the Dargo Hotel and have a very refreshing and needed beer. It seems that due to New Year's Eve coming on, only plastic "glasses" are in use and you have to buy one. It is only $2 and they are a memento as well. For some reason, the barmaid shook her head when we said that we still wanted a beer even though it was going to cost us $5 a middy. We need some fresh bread so after the beer we go to the store and get some. We also get a pie each for lunch. 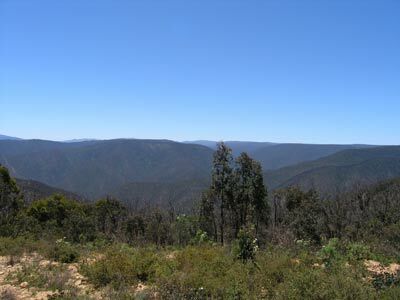 At 12:50 pm the temperature has risen to 36ºC and we head out to the north-west of Dargo towards Grant Historic Area. 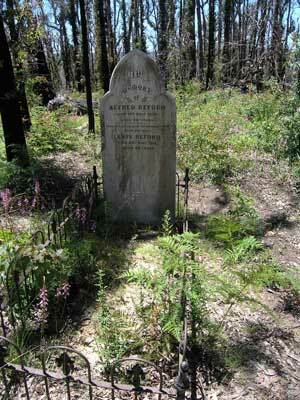 This is the site of an old gold mining town. The whole area around Grant was a series of towns/villages that grew up around the Gold Rush. Gold was discovered in the area in 1850 and by 1865 a town called Mount Pleasant with about 700 to 800 people was thriving on the spot. It was renamed Grant after the Commissioner for Lands, J.M. Grant, after he visited in March 1865. By the end of the year there were 15 hotels, a church, courthouse (with that many pubs, certain to get a lot of use), police station and more. 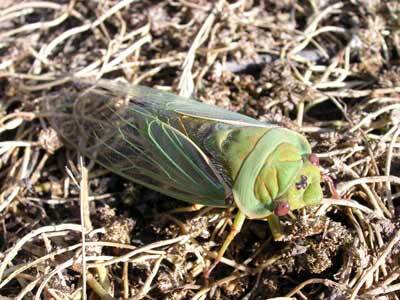 Eventually the population reached 2,000. 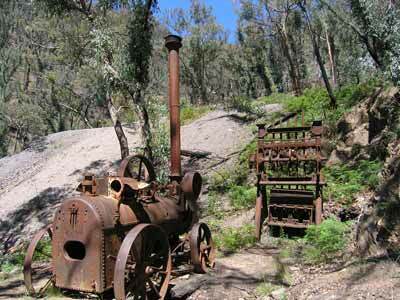 The boom years were the late 1860s and there were eight crushing mills, tramways and over 250 gold reefs under work. Within 10 years the gold was gone and by 1903 there were only six families left. The last residents left in 1916. The first place we can stop to have our pies turns out to be the cemetery at Grant. After eating we spend a few minutes looking around but there are only two headstones and it is not that interesting. We then move to the main Grant Historic Area where the town used to be located. 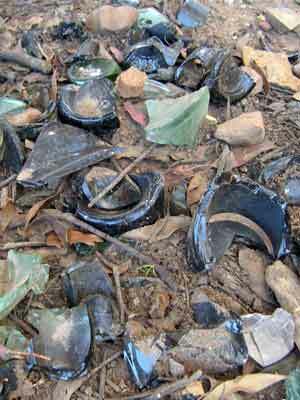 We have a look around but there is little to see except some obvious signs of previous habitation like broken bottles and china as well as some drains. There are a few interpretation signs but overall, it is disappointing. 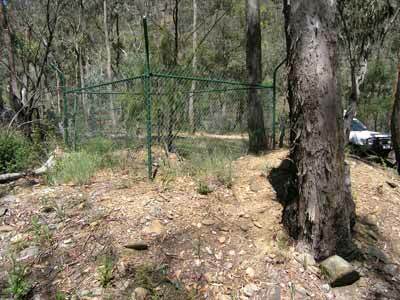 There is also the Grant Camping Area here but it looks like the toilet has yet to be rebuilt after the fires. There are lots of gold mining areas here. Some of the towns that used to be here were Stonewall, Hogtown, Bulltown and Talbotville. We are driving to Talbotville via the Crooked River and about one kilometre from Grant there is a helipad that gives some nice views to the north. 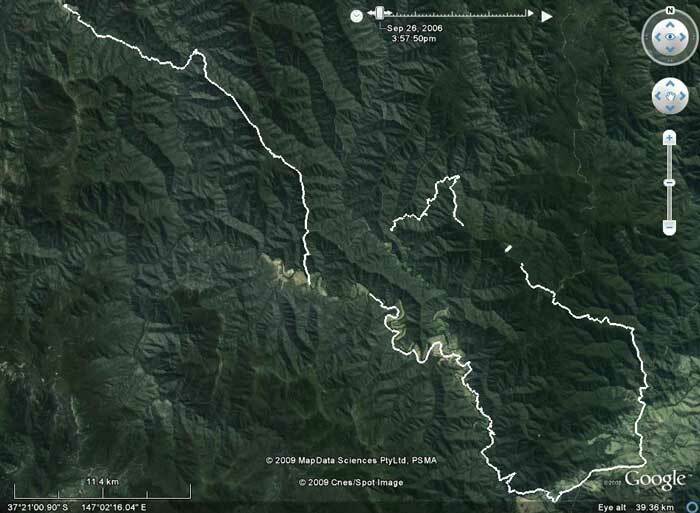 We take the Bulltown Spur Track which drops steeply to the river. It is low range all the way down. There is little left of the mining other than numerous mine shafts and holes. We stopped at the first "town" but see nothing. We cross the river many times, in all 23 times from Stonewall to Talbotville. We come to New Hope Mine turn off. This leads up 300 metres to a car park. 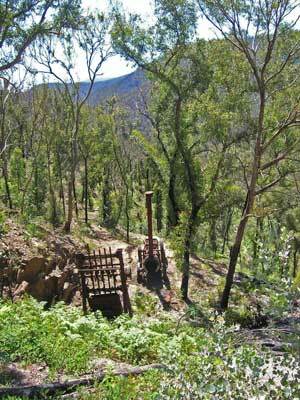 We decide to walk up to the mine as there is machinery here. What a mistake! 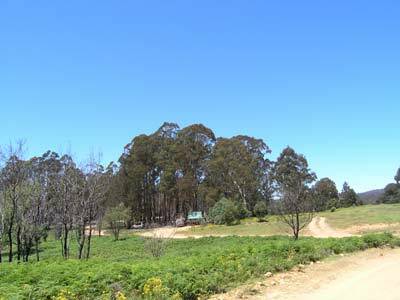 The temperature is now 40ºC and it is a good 15 minute walk, climbing 140 metres. We make it to the mine after at least 6 stops. We are exhausted. I take a few photographs of the portable steam engine and rock crusher. I climb a little higher onto the pile of crushed stone left to look for the actual mine while Kelly starts the walk down. She hurt her knee badly in early October and now, almost three months later, it is still not 100%. I do not find the mine and as there is lots of water all over the place, I do not feel like slipping and hurting myself. We decide to have a swim in the river so once back at the car we move down to the start of the track which is right on a river crossing. 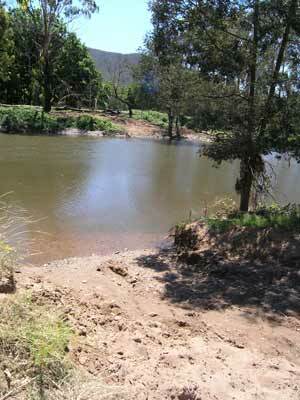 We quickly get our swimmers on and lie in the river (it is too shallow here to do anything else). 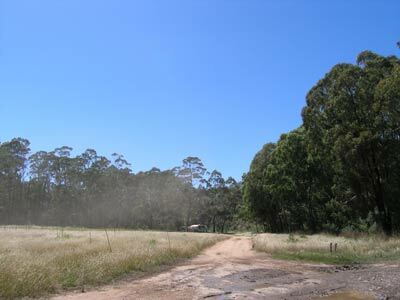 We spend 15 minutes cooling down before driving the 3.5 kilometres to Talbotville, getting there at 4:20 pm. This is a very nice camping area, although there are lots of people. The site is bound by the river on almost three sides and there are lots of sites and a few toilets. One annoying fact is that there are lots of motor bikes and young children are riding them around the camping area. I feel sorry for some people who have set up camp near the track as every time a bike goes by, they cop a load of dust. 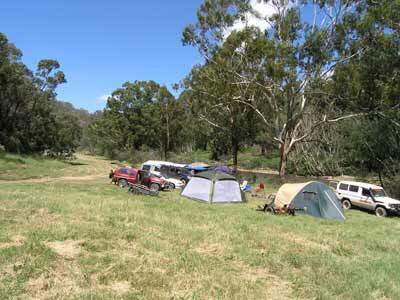 Anyway, we find a spot near the river and next to a large camp. This has a table and BBQ and I ask the next door neighbours if they are using them. It turns out that they aren't, so we set up our chairs. It is still very hot so we do not set up our gear yet as the best spot will be in the sun for a while. When the shade has moved to where we want to camp, we set up the car and now hot, we walk to a water hole that our neighbour has told us about. This is deeper and we can swim a bit. Nice. Tonight we are having pizza. 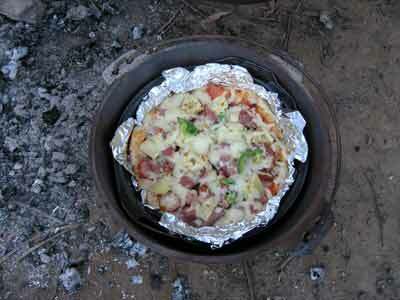 I first made pizza when on the Simpson Desert trip back in 2003. It is quite easy and I will put the recipe here. 1 yeast pack Mix together using a strong knife and then knead till fully mixed. If the weather is cool, turn the heater on in the car and place the bowl under the steering wheel and run for a few minutes with windows up (or put on bonnet with a towel over it). If hot, place in the sun with a cover over it. I use a camp oven and we have a wire tray (trivet) in the bottom that means that anything that you place in it is not on the bottom. 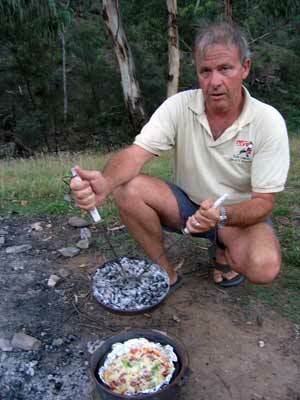 We use a cake tin that fits just inside the camp oven. I place aluminium foil (good quality) in the tray and grease and flour it. The oven should be preheated for at least 30 minutes by placing direct on the flames and with some coals on the lid. Once the dough has risen, divide it into four. I put flour on our cutting board and use a beer or soft drink can to roll the dough into the desired shape and thickness. Place it in the foiled tray. I put pizza sauce and cheese on the dough and then the toppings. This can depend on what you have. We use onion, raw chicken, salami, cabanossi, cooked pork and even cooked sausage. A little Italian herbs is sprinkled over and some more cheese added. I add a little of my home made chilli sauce to my side (Kelly hates it). We prepare three pizzas like this and the fourth bit of dough is made into a cheese and garlic bread pizza. Once the oven is hot, drop the first pizza in (the garlic one) and place back on the flames (not coals) and put fresh coals on the lid. After a couple of minutes check the pizza. If it is starting to go brown at the very edges of the pizza, remove from the fire and place on the ground. This one should only take about three minutes to cook as it is thin. Repeat for the others, but leave for at least a couple of more minutes after removing from the fire before checking. After four minutes, check the pizza top and base. If the bottom is cooking too slow, put it back on the flames for a short time. It will take between 6 and 8 minutes to cook. Once the top has got some colouring, all the cheese is melted and the base is an even light brown, the pizza is ready. You can remove by taking the foil in your fingers (it is not hot) and lifting out. Once we have eaten the first one, we put the second on and then the third. We usually end up with enough for lunch the next day as well as another snack. Brilliant. Anyway, we make the pizzas and I cook them. As usual, they taste great as we eat them two or three hours from the nearest pizza shop. I do not think you could get delivery out here!